To "CASE" is to "Copy And Selective Edit"...there are so many things I love about Steffi's card, it was hard to choose! I'm not sure what measurements she used for her card but I liked the elongated shape and thought it would be fun to do a different size than I normally do, too (my card base measures 6-1/2" x 8", folded in half length-wise). Mine is a little taller in height and shorter in length than hers, but a good size for the stamp images I wanted to use. I was also drawn to the colors she chose (Peekaboo Peach, Pumpkin Pie and Lemon Lime Twist). I started by stamping the cake and flower images (from the Cake Soiree stamp set) in Basic Black ink onto scraps of watercolor paper. I watercolored the images using ink from the lids of Peekaboo Peach, Pumpkin Pie and Lemon Lime Twist stamp pads and an Aqua Painter. After coloring the leaves and flowers on the cake, I used a very soft wash of Peekaboo Peach to add a hint of color to the cake itself. The sentiment is stamped onto a small strip of Basic Black cardstock using VersaMark ink, then heat embossed with white embossing powder. The cake and flowers were then cut using the Big Shot and the coordinating framelits, Sweet Cake. I also cut the foliage with the framelits, from Lemon Lime Twist cardstock. For the background, I cut a piece of watercolor paper to 3-1/2" x 6". I placed the cake where I wanted it to go, then, before adhering it to the paper, I used an Aqua Painter and Smoky Slate ink to paint a shadow under the image. The cake and foliage were adhered with SNAIL adhesive. I adhered the sentiment and flowers with mini glue dots to give them a little bit of dimension. The background piece was adhered to the Crumb Cake card base, and then I finished it up with a few Pearl Basic Jewels. 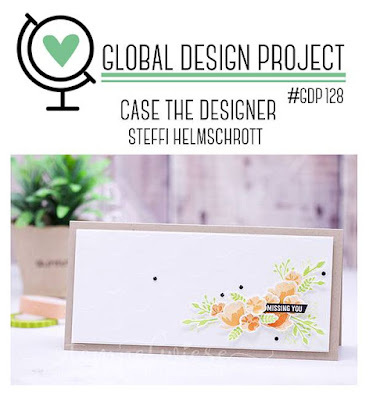 Be sure to check out all the beautiful cards this week over at the Global Design Project!